If you're in the market for the fastest compact five-door available, then the Audi RS3 Sportback should be your only choice. This is a road-legal missile and the undisputed speed king of fast five-door hatchbacks. Delivering a powerful punch to its competitors is the most powerful of Audi's famed five-cylinder engine. Turbo-charged to increase performance, the 2.5-litre petrol unit produces 362bhp and is electronically governed to 250kmh – though 280kmh is possible from a de-restriction at an additional cost. What is more impressive is the Audi's 0 to 100 kmh at just 4.3 seconds. 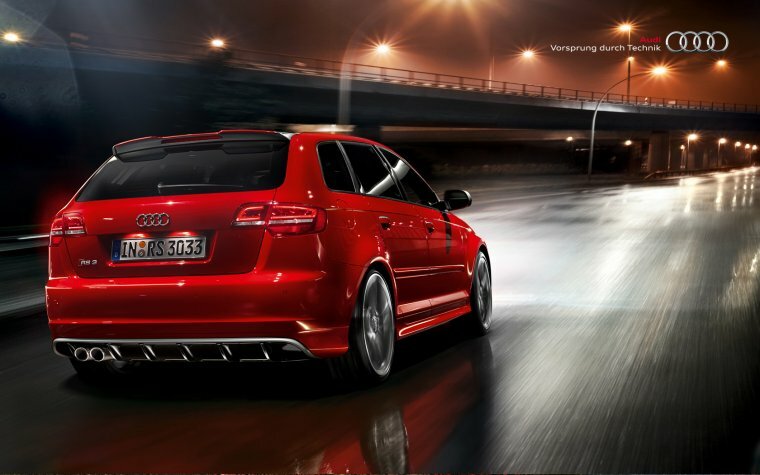 Delivering this speed is a seven-speed S-tronic automatic gearbox and Audi's quattro four-wheel drive system. Both have been tuned to be more responsive, theoretically delivering more fun behind the wheel. While official efficiency figures of 8.1 litres/100 kms and 189g/km of CO2 best the previous-generation RS3's 9.1 litres/100 kms and 212g/km statistics. The quattro system is designed in such a way as to minimize the 'pushing wide' into corners with understeer. Wider tires at the front than the back play their part here too, and while the rear wheels can have up to 100 percent of the power sent to them to keep cornering lines in check, seldom does this actually happen. Sending proportionally more power to the 'outside' wheels of a corner now also helps tighten the RS3's trajectory. Audi's Drive Select function, switching between different driving modes, impacts the steering, throttle response, gear change points and, where fitted, the adaptive suspension's compliance. The RS3 Sportback remains largely unchanged visually- a honeycomb-pattern grille, and gaping chasms cut into the outer edges of the front bumper feed in additional cool air, a rear diffuser with enlarged oval exhaust pipes emerging from either side, and a unique design of 19-inch alloy wheels. Standard LED headlights and 25mm lower suspension are evident. The RS3 maintains its classiness and solidity, and Audi have no plans to launch a three-door RS3 but has hinted a four-door saloon may eventually go on sale.